Repels moles, gophers, armadillos, & other burrowing animals. Fast-acting dual action repellent works to repel unwanted pests by taste and smell. Made with specially engineered castor oil pellets, the repellent is easily absorbed into the ground, allowing the repellent to reach the tunnel quickly. This all- natural, poison free mole and gopher repellent is safe to use on lawns and gardens as well as around children and pets. This formula penetrates the tunnel and makes it smell and taste unpleasant, sending the unwanted pests scurrying to find a more favorable place to live. Options: 10 lb. 4 lb. 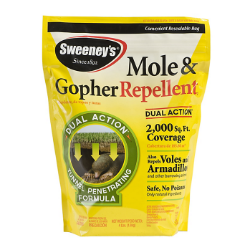 Sweeney’s® Mole & Gopher Repellent works by slowly driving burrowing animals away in stages. Avoid treating the entire lawn in one application – this may cause moles to tunnel wildly in any direction to escape the repellent. Applying the granules over the lawn in stages will steadily herd moles away from the lawn area not yet invaded by moles. Before applying the castor oil granules in your yard, locate the active mole areas to determine which way to move moles out of your yard. Day 1, spread the granules over the first area and water-in with a sprinkler for approximately 20 minutes. Watering allows the concentrated granules to penetrate deeply into the lawn. Day 2, spread the granules over the second area; water-in the same area as Day 1, plus the second area to get the mole moving. Each day's watering allows granules to penetrate more deeply. Day 3, spread granules over the third area. Water-in the same area as days 1 and 2, plus the third area to keep the mole moving. Day 4, spread the granules over the fourth area. Water-in the same area as Days 1, 2, and 3, plus the fourth area to move the mole out of your yard!